Yesterday we went wandering around the neighborhood and ended up on Diversey across the street from the Red Hen. Now I ask you, how could I resist going in and getting me some of this? 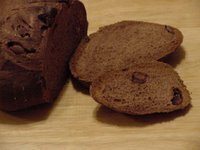 It's chocolate bread and it's delicious. The bread itself is dense, with just a hint of chocolate, but there are chunks of chocolate scattered throughout. We just had it plain but it would be fantastic with some kind of nut butter, or Nutella, or just plain butter. Lynda turned me onto this. Thanks, Lynda! Today we went to the Lincoln Park Zoo and I saw two things I've never seen before. A few moments after we entered the Lion's house the lion came in from outside, walked up to the bars of the inside cage, and gave a series of roars that would have made the MGM lion proud. It was awe inspiring. And up to the moment the lion roared and I heard it up close and personal, if you'd asked me if I'd ever heard a lion roar I would have said yes, thinking I had. But once you hear it for real there's no mistaking it. You feel it in your bones. There's a reason they call the lion the King of the Jungle. Then, in the gorilla house, I saw a mother gorilla cradling her baby. The baby was born in July, and the mother still won't let go of it and just sat there guarding it while the other gorillas wandered around. It was her fifth baby and the father's fist. She's 27 and he's 16. I like how things work in the gorilla world. There were signs all over the place to explain anything that might be considered unusual in all of the habitats. I guess they want to be extra sure everyone is aware that they're taking good care of the animals after the recent deaths. While some of the animals seemed to be staying indoors and out of sight, we got to see quite a few. In a couple of hours we're going to start the long drive down to Austin. I may not have the chance to post while I'm there, so I hope everyone has a safe, happy Thanksgiving and gets to eat lots of turkey, stuffing, pumpkin pie and, best of all, lots and lots of turkey sandwiches! that bread sounds yummy! i can't wait to try some... have u considered baking, perhaps? 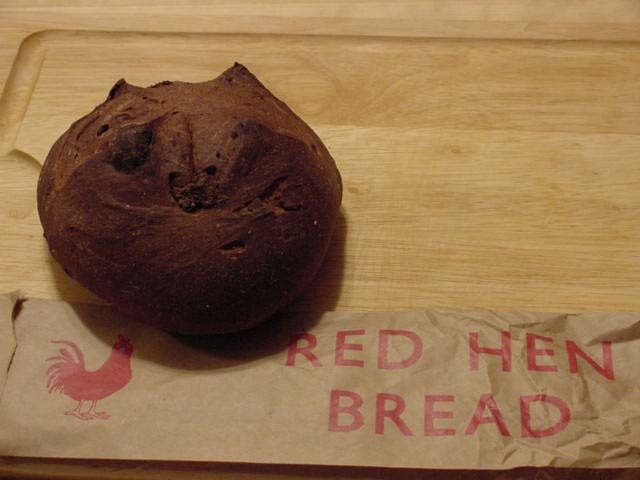 Am very jealous, as I have not had chocolate bread in months and months. Glad the fam enjoyed it. I love love love that bread, Debi. Maybe we should head on over when i'm back from new york.